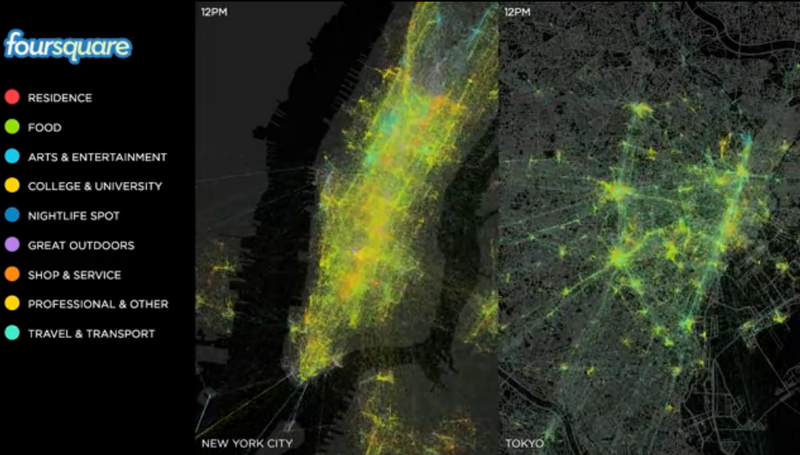 Foursquare CEO Dennis Crowley has shown off a fascinating visualization that tracks the “pulse” of check-ins in New York City and Tokyo at recent events. The company has now posted the clip online so that we can all enjoy it. Check-ins are color-coded based on type of venue and then tracked across the time of day. Foursquare used a year’s worth of data for the visualization. Dennis Crowley , il CEO di Foursquare durante le ultime fiere tecnologiche ha mostrato una affascinante rappresentazione che monitora le "pulsazioni" dei check-in a New York e Tokyo. L'azienda ha ora pubblicato on-line la clip in modo che tutti noi ne possiamo godere. I check-ins sono colorati in base al tipo di luogo e distribuiti lungo le 24 ore. Foursquare utilizzato un intero anno di dati per la visualizzazione.